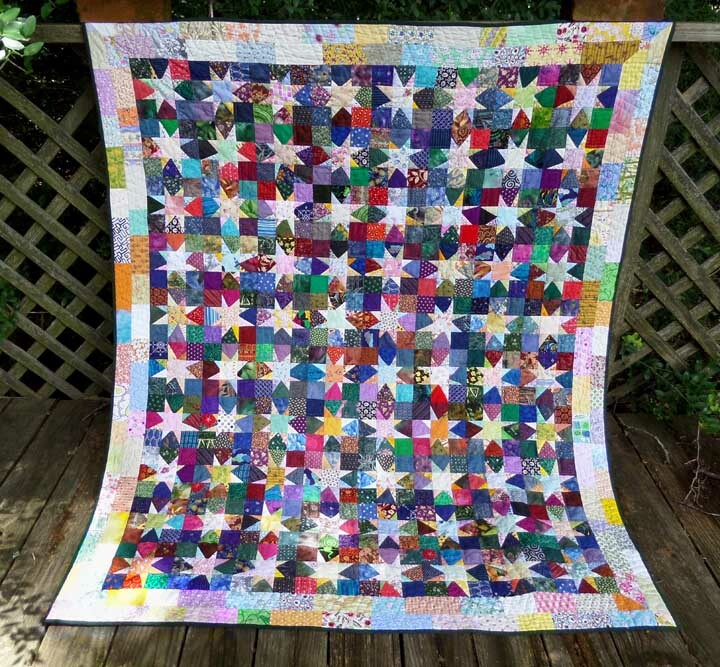 12/29/13: Saw a demo online on making Wonky Star blocks (Bonnie Hunter’s – Wonky Wishes). Looked like great fun and since I just tuned up my vintage Singer 301, I thought I’d give it a go. Before I knew it, I’d made several. They are great fun to make…. I don’t have to match points or color within the lines….the funkier the better! Have no clue what I may do with these 6″ blocks but anytime I feel a little wild, I’ll make more! 10/08/14: Since I finished hand stitching ‘Urban Renewal’, I was in the mood to do some machine piecing. I dug out this UFO (Un-Finished Object) and played. For some reason, I was under the impression 30 blocks would make a nice size sofa quilt. WRONG! 30 blocks only make a nice size DOG quilt. Today, I’m cutting more fabric for more blocks while I contemplate my next hand stitched project. 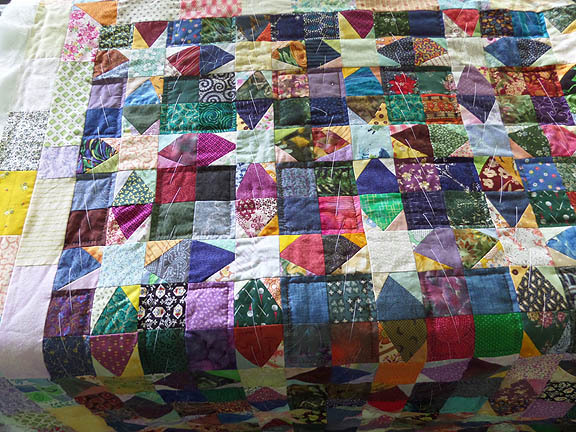 It’s a toss up between hand quilting a finished top or starting a new one. 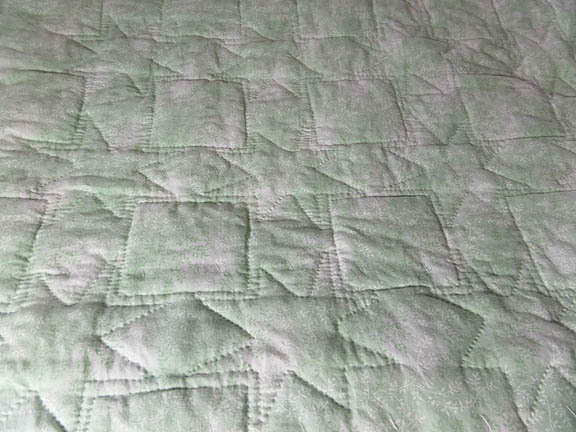 02/21/15: I’ve once again dug this from the UFO pile and stitched more blocks. I like how the stars appear to be twinkling in a funky, silly, wonky way. I now have enough blocks to make a nice-sized sofa quilt. Today, I’ll begin stitching them together and deciding on borders. 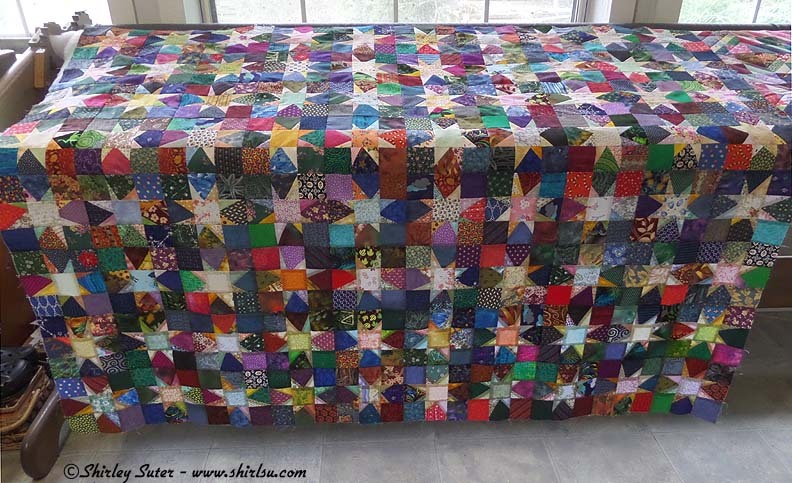 03/22/15: After measuring the width of this sofa quilt, I decided it would benefit from another row (10 blocks) of stars. I finished making them today and have stitched the rows together. It currently measures 59 ½” x 48″. 04/23/15: Scrappy border has been added and basting is done. Quilting has begun. 06/19/15: Time to stick a fork in it cuz this baby’s done!! I finished the binding last night and hand washed it this morning. It finished at 53 ½” x 65″. Photos and more description will follow (after I clean storm debris from the deck). 06/20/15: This was such a fun quilt to make. When assembling the blocks, I simply pulled out my pre-cut 2½” squares and separated them into dark and light for the backgrounds and star centers. The star points were pulled from my ever-growing tiny scraps bin. The border is made from light 2½” strips and the label was (obviously) hand embroidered on a fabric scrap. 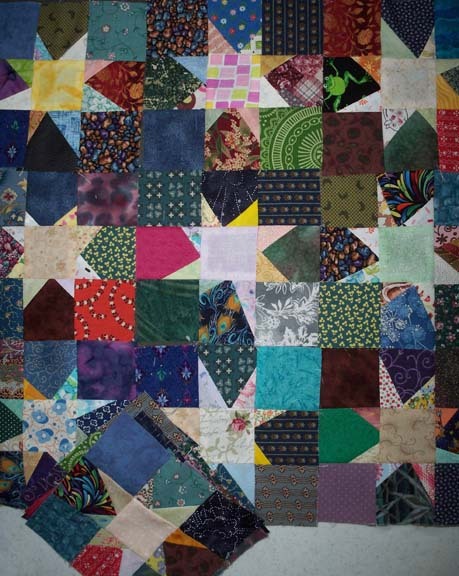 The stars were quilted near the ditch and the 4-patch segments were stitched ¼” from the ditch. 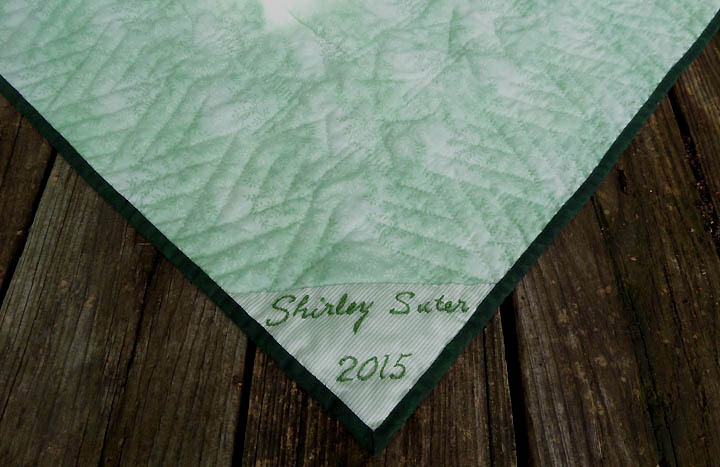 The border was quilted in a design known as ‘Woven’ from a stencil I made myself. I like it and will use it again. After reading Bonnie Hunter’s tutorial for narrower bindings, I decided to give it a try using trimmings left over from the Split-16 quilt already on the cutting table. I love how fate can often provide the perfect materials for a project! Thanks Bonnie! I absolutely LOVE the narrow binding and will use it often. Thanks Lorraine. I smile each time I look at this quilt. So glad you like it too. Copyright © http://www.shirlsu.com 2014 - 2019 all rights reserved.